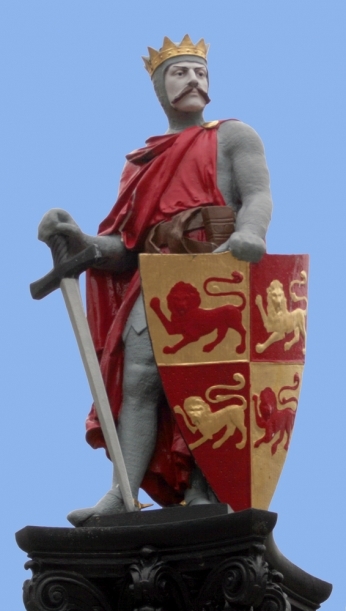 Hailed by the Mostyn family as one of their most honourable ancestors, Ednyfed Fychan was steward or distain to the Gwynedd princes Llewelyn ab Iorwerth (c.1173-1240) and his son Dafydd (c.1215-1246) from about 1215 to his death in 1246. Ednyfed’s coat of arms initially featured three Englishmen’s heads, presumably cut off by his own sword, though following the so-called Acts of Union between England and Wales political correctness dictated that these severed heads be replaced by helmets in later heraldic depictions. Ednyfed and his family were well rewarded for their services to the kingdom of Gwynedd and his descendants became some of the most powerful figures in late-medieval Wales. The Mostyns claimed descent from Ednyfed Fychan through their two Anglesey courts and lineages of Trecastell and Tregarnedd. Nevertheless, Ednyfed’s most esteemed descendants were the Tudors of Penmynydd. In 1485, with the support of his Mostyn cousins, a member of this Tudor family became King Henry VII of England.